Knock Down Warehouse Steps Archives - Shelving & Racking Ltd. 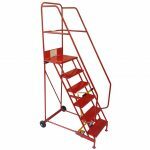 Supplied in kit form, these heavy duty warehouse mobile safety steps are designed for easy transportation and access to height restricted areas. Once assembled these steps have the same specifications as as our standard warehouse safety steps. Depending on the size these steps are assembled by fitting up to 18 bolts.